When you hover over an event on the calendar, you'll get a window that shows you the full details for the event. This means less clicking to find out about an event. You can also get RSS feeds for calendar events as well, and you'll find all of those listed here. WCCLS libraries have great events each week and we're pleased to have a calendar that makes it easier for you to find those events and get reminded of them. 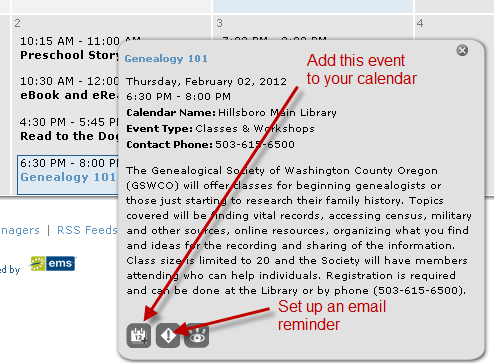 If you have any questions about using the WCCLS events calendar, please email us at webmaster@wccls.org. To get to the events calendar from the WCCLS homepage, just look for the events icon near the top right of the page.